We have a new addition: meet Leia! 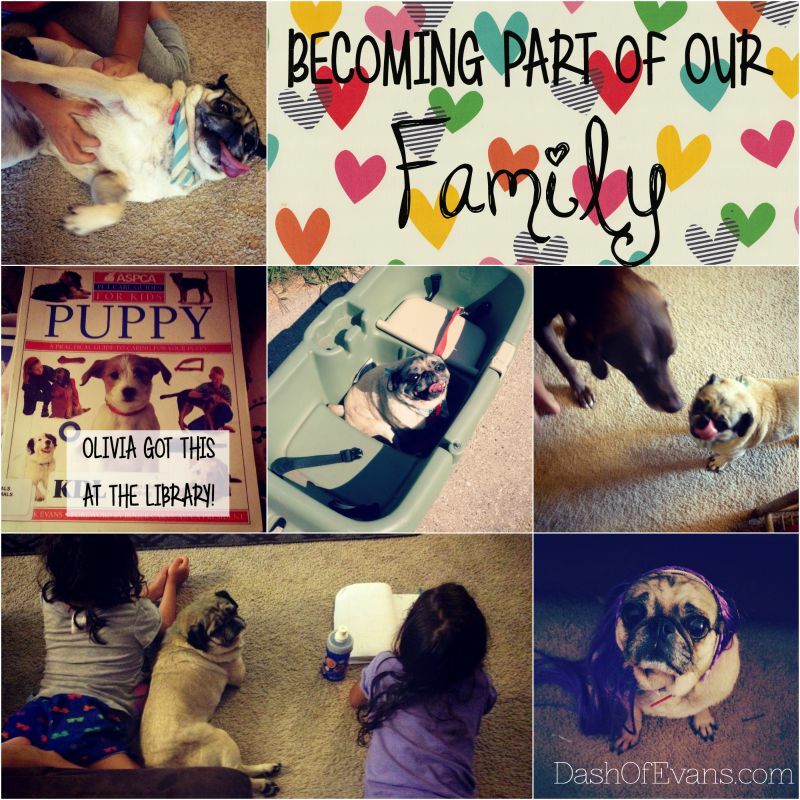 Everyone else is having babies and we’ve decided we needed one too–a senior pug kinda baby! If you follow me on social media, you know how obsessed I am of taking photos of this little lady. She is great with kids and pretty much sleeps all day. 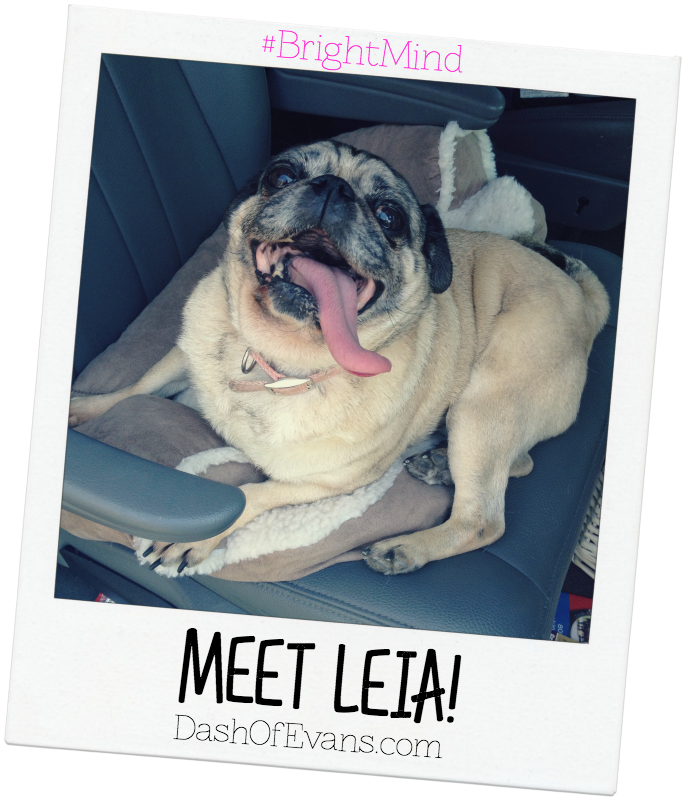 Leia just needed a loving family who could spend quality time with her! Did you know a dog is considered a senior at seven years old? Now that Rambo is seven and Leia is ten, I figured it was time to do some research on feeding older dogs. Since we’ve adopted both dogs a little later in life, I want to make sure we can enjoy as much time with them as possible. Before these two, we had a senior English Bulldog named Izzy. I like to adopt dogs instead of getting new puppies, especially when they’re older. Purina Bright Mind is a formula exclusively for senior dogs. After seven years old, the glucose metabolism in a dog’s brain begins to change, which affects memory, learning, awareness or decision making. Purina discovered a way to promote alertness and mental sharpness in dogs 7+ through nutrition and has introduced BRIGHT MIND Adult 7+ formulas! After hearing that, I couldn’t wait to try it with my pups. There are two varieties: small and large dog. Since neither dog had Purina food previous to buying Bright Mind, we had to take some time introducing the new food. As recommended on the bag, you should slowly mix old and new food for 7-10 days, increasing the amount of Bright Mind each day. Leia loved the smaller sized bites of food, compared to her old variety. Before it would take her all day to eat a single serving and now she gobbles it up each meal. Since Rambo scarfs down his food in record time, we recently bought a divider bowl to slow him down. It has been helping quite a bit! He loves the food, too! The minute I came home with Leia in July, the girls became obsessed. They treat her like a baby, dress her up and I’m constantly reminding them that she isn’t a little puppy! Before we owned her, Leia had a torn ACL and hip problems, so we have to carry her down stairs. Those injuries don’t stop her one bit, though! She hops around the yard and can keep up with Rambo’s long legs. Rambo took a bit longer to warm up to her, especially since she can be quite a diva. Most nights, you can find Leia laying on Rambo’s HUGE dog bed, stretching out, almost taunting him. He’s too nice to make her move, so he will lay elsewhere. I have found them snuggling more often now! Introducing a new dog into a household can be challenging at times. 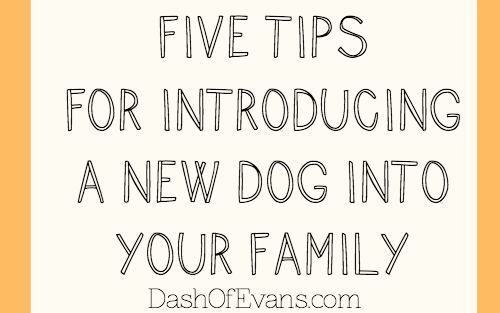 I have FIVE tips to keep in mind when you are looking to add a new dog into the household, especially a senior one! Keep Active. Taking your new dog on walks with all family members makes them feel included, plus helps burn energy. Brushing after walks is a great bonding experience too. Since Leia can’t walk too far, we take the wagon along with us on longer walks so Rambo still gets exercise. Give them a special space. Having a special bed, crate or area your new dog can go to feel safe is very important. There may be times when they want to sleep or get overwhelmed with the new environment, so having a bed, blanket or special area is essential. Leia came with two beds and she likes one of hers under the end table–it’s her place to escape! Remember they have a past. The dogs have lived a long life before you and they may have certain fears or triggers. Leia is afraid of closing doors, loud noises (which we learned when we got her JUST before 4th of July) and other little things. Learn as much as you can about your dog and try to avoid anything they might fear, especially before they are comfortable in the family. I was so proud when there was a loud thunder storm the other night and Leia didn’t even shake! I feel like she is completely comfortable with us now. Be Patient. Not everything will be perfect at first! Your dog will be excited to be in a loving family, but they might continue some bad habits from their past. Be patient and try to kindly fix the problems. Leia doesn’t like when she can’t find me and will have intentional accidents in the house. We are teaching her to stand by the patio door when she has to use the bathroom. Although things aren’t perfect, she really is learning. If you’re not sure how to fix any problems, your vet will be a great source of information! Do you have an adopted pet? What tips do you have? 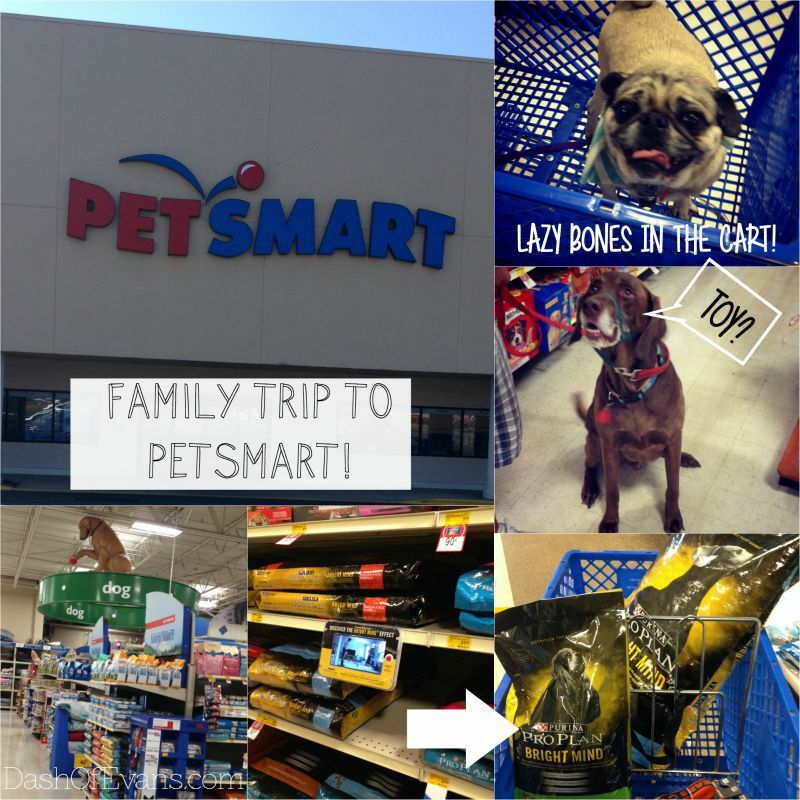 Be sure to check out the Bright Mind or other Purina Pro Plan varieties for your dogs at PetSmart! New Tasty Treat: goodnessknows® Snack Squares! Yes! Seniors are usually quite low maintenance and super cuddly. I'm so glad she was able to find our home–she's a great addition. Welcome to your new adoptee!!! So glad you have a heart for the older dogs, someone needs too!!! I guess I will have to start looking into senior food since two of mine are 6 years old. I have really found it's made a difference! PetSmart has so many options and they're super helpful. Congratulations on your newest family member! I love that you adopted a "senior" doggy 🙂 Leia is in great hands. Congratulations on your newest family member! How exciting, and how awesome for her to have found sucha loving home. I love seeing senor dogs being adopted. What a cutie 🙂 And so glad you gave an 'old' dog a new chance!